The H.Upmann Magnum 46 is a Cuban classic, a rich and complex medium-full Coronas Gorda, 5.6” (143mm) long, of 46 ring gauge, and comes in a 25 cigars box. It is one of the most popular cigars of the brand with huge aging potential, with a strong following. Sadly The H. Upmann Magnum 46 is not as popular as it should be. However this Upmann has garnered its own accolades over the past few years, since 2003 the cigar has been rated twice, each time scoring 92 points. Considered by some to be the best Corona Gorda. • Well-made, even burning with dark oily wrapper. Creamy and sweet. This cigar is what H. Upmann is all about. 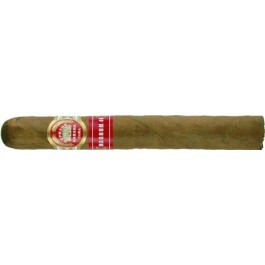 The H. Upmann Magnum 46 has a light chocolate brown wrapper. When pressed between the fingers there is a slight give. It is almost without veins with tight seams and the tooth is very subdued. The triple cap is rounded and well applied, and the bunch is firm and consistent. The wrapper gives off scents of cedar, hay and the beloved barnyard. The foot smells of cedar and an aroma that reminds one of tamarind. The Magnum 46 has a nice easy draw and burns a bit wavy but is self-correcting. No touch ups required. The cigar greets you with smooth flavors; the body of the cigar is mild. However, the aftertaste is long enough to stay on the palate until then next draw. The whole first third is very creamy and mild. The cigar delivers rich spicy flavors of pepper, woody flavors of oak, fresh grassy flavors and some notes of graham cracker. By the end of the third, the cigar is releasing lots of sweet flavors with a pinch of sour taste from an orange zest. The aftertaste is of the flavors of the body, minus the orange tangy note. The final third remains smooth with lots of cream, and its texture is now rich and chewy. The flavor profile is even sweeter, despite the orange zest in the background. In this final part, the flavors in the foreground are still similar to the first two parts. There are woody aromas of cedar, chocolate, coffee, graham cracker, toast and light cream. The body strength of the cigar increased again, but the balance of flavors is so good that it leaves a nice combination of tastes on the palate. In summary, the Magnum 46 is very rich in flavors. It also a complex vitola that is a delight to smoke until the nob.